Bluetooth is a short-range personal area network technology which is used for transferring files, contact information, connecting hands free sets and stereo headsets to mobile phones, tablets and PCs wirelessly. 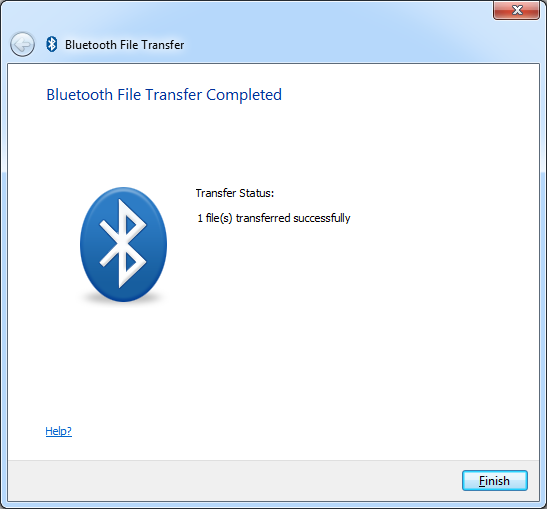 While generally touted as easy to set up and get working, for a variety of reasons often related to the quality of the software Bluetooth stack provided with many USB Bluetooth devices, users have often found frustration in getting things beyond just basic file transfer working. This can be because of outdated software without profile support for newer devices, or a lack of software altogether, leaving the user to rely on the operating system’s default (and often somewhat limited) Bluetooth stack. Over the years, it has made the evolution through numerous revisions each with new benefits. The initial Bluetooth 1.0 was superseded by 1.1 which offered more robustness against interference through adaptive frequency hopping, and higher transfer rates in practice. Bluetooth 2.0 bought newer modulation modes which allow for higher speed data transfer and practical battery life savings for portable devices. New pairing modes were introduced which simplified and secured pairing. 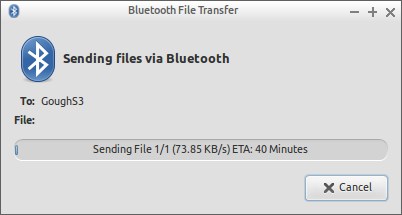 Bluetooth 3.0 bought the ability to use Bluetooth as a signalling channel to use Wi-Fi as a higher-speed transfer medium (although this functionality is often problematic). Finally, we come to Bluetooth 4.0 (also known as Smart and/or Low Energy) which introduces a new physical layer system altogether which enables super-low-powered devices that run for years off a single battery. Users running on older Bluetooth 1.0/1.1 dongles have many incentives to upgrade. 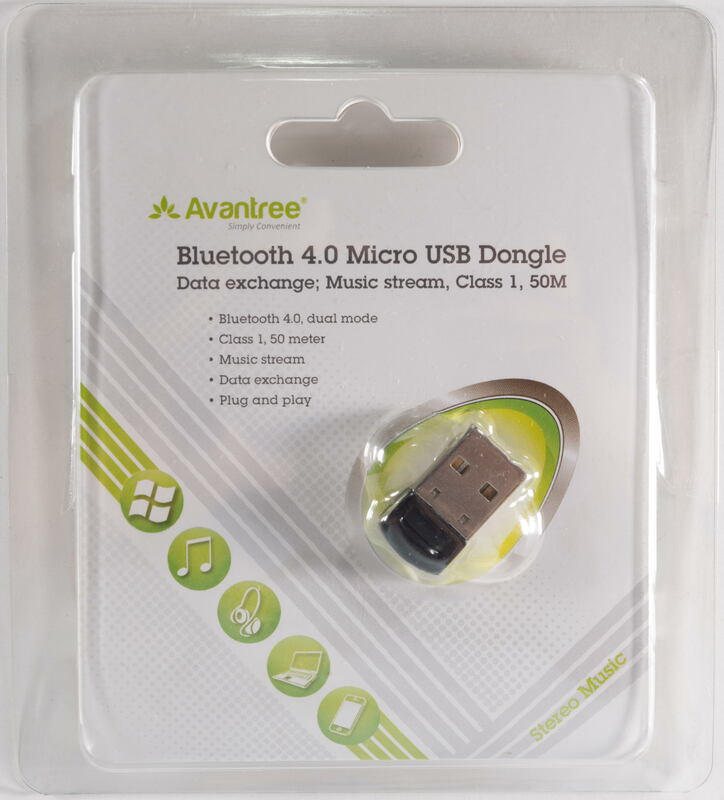 Thanks to Mobilezap, I’ll be looking at the Avantree Bluetooth 4.0 Micro USB dongle (priced at AU$18.99 at time of review) and seeing if it is a worthy upgrade! 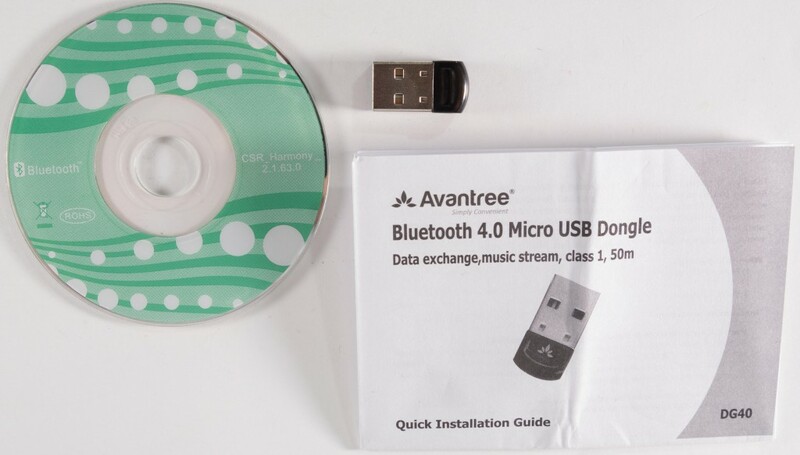 The Avantree Bluetooth 4.0 Micro USB Dongle came packed in a transparent plastic clamshell which was held together with clear tape seals. 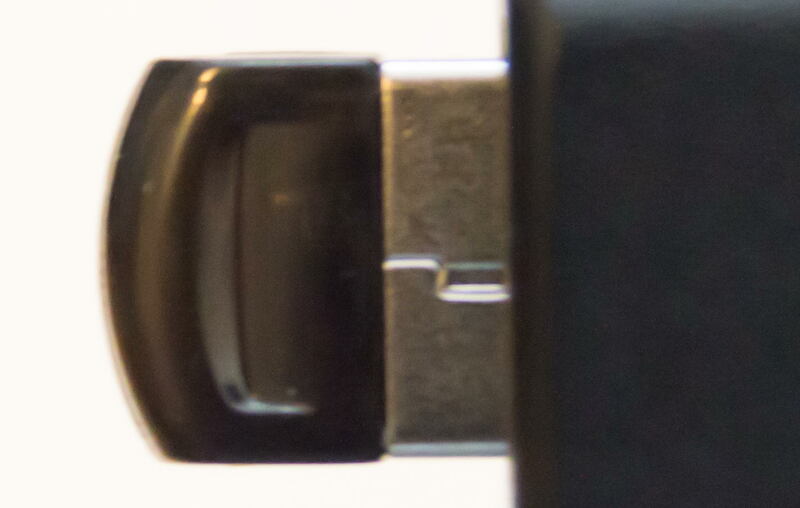 The dongle is clearly visible from the front and measures about 23mm from tip to tip, with the black section measuring about 8mm. That’s pretty small! It claims to have support for Bluetooth 4.0, as a dual mode (i.e. classic and low-energy) device. It also supports file transfer, audio and is a Class 1 device with a 50m claimed range. Typically most Class 1 devices advertise a 100m range (whereas Class 2 devices with lower output power typically advertise a 10m range), however, it seems that the 50m claim may be related to the efficiency of its antenna (due to small size) and possibly to be more in-line with real-world expectations. The rear of the box extols its various features and specifications. It appears to support the majority of the Bluetooth profiles available today, through the use of the CSR Harmony Bluetooth stack. 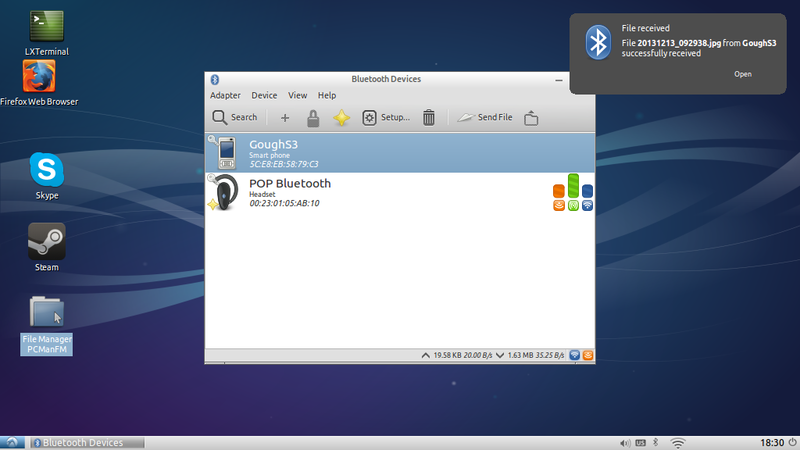 The default Windows Bluetooth stack is not this capable! Included in the package is an 8cm mini-CD with the drivers, the USB dongle itself and a Quick Install Guide. Please heed the instructions in the install guide! Also, you will need to use the CD, so if you don’t have a drive in your laptop, please copy the files off onto a USB flash drive using another computer. You will not derive the full benefit of the dongle simply just by plugging it in (but it will work for basic uses, but please don’t do this – you’ll find out why later). 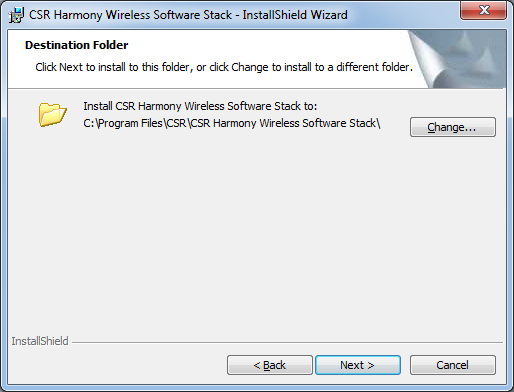 It is supplied with CSR Harmony version 2.1.63.0. The software is for Windows only – users of Linux will have to rely on their OS’s included bluez stack. 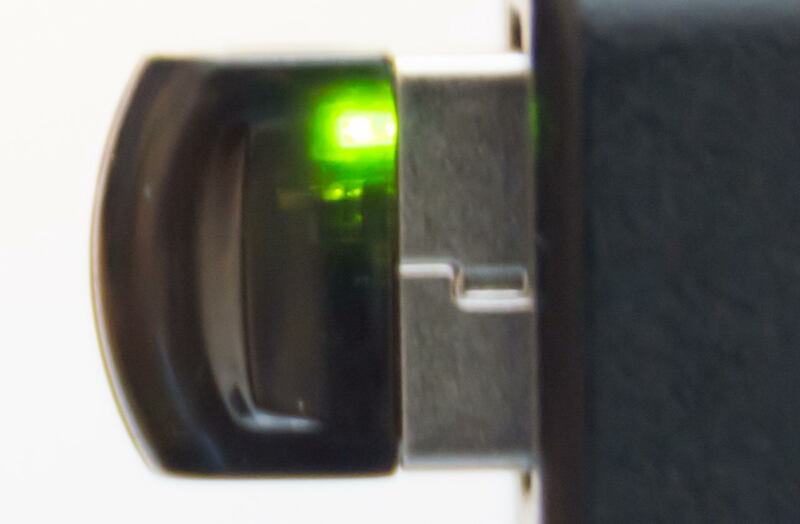 Unusually, the dongle itself has its flashing LED indicator on the bottom of the device where it’s not in plain view. It’s not particularly bright, and will not distract you too much. The dongle protrudes about 1cm from the body of the USB port, and the antenna (a printed circuit board antenna) is on the extreme end of the dongle. The dongle feels quite solidly built – I didn’t feel confident enough to try taking it apart for fear of damaging it, so there won’t be any photos of the internals unfortunately. The dongle itself has a Vendor ID of 0A12, Product ID of 0001 and a Firmware Revision of 8891. It’s HCI and LMP version is 6.8891. Its MAC address starts with 00:1A:7D, corresponding to Cyber-Blue (HK) Ltd. It identifies itself as a CSR8510 A10. Getting this dongle installed is no drama (in most cases) if you follow the instructions carefully. Start by NOT plugging in the dongle into a USB port, however tempting that might be. The first step is to remove all previous Bluetooth stacks and driver software. This is important to prevent the previous stacks from controlling your new Bluetooth device, causing conflicts or limiting its abilities. You can achieve this by removing it via the Add/Remove Programs applet inside the Control Panel. 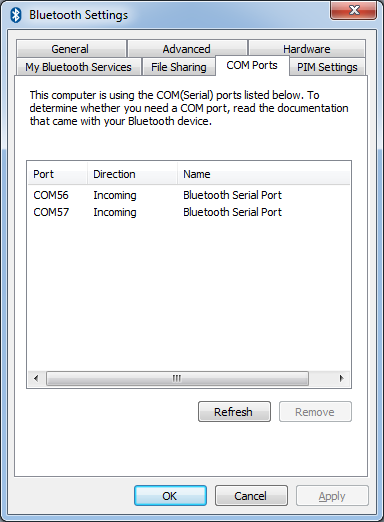 If you have IVT Bluesoleil installed, or Broadcom/Widcomm Bluetooth Software installed, they should be removed along with any other Bluetooth software. At this point, it is best to restart your computer to ensure that the software starts up correctly, despite the wizard not requesting it. Don’t be lazy – do it! Then, you can now plug in the USB dongle, which should be detected and result in the installation of a few devices and the appearance of a new Bluetooth icon in your task tray. It should also, after the installation, pop a balloon that tells you that your Bluetooth Device is Available. 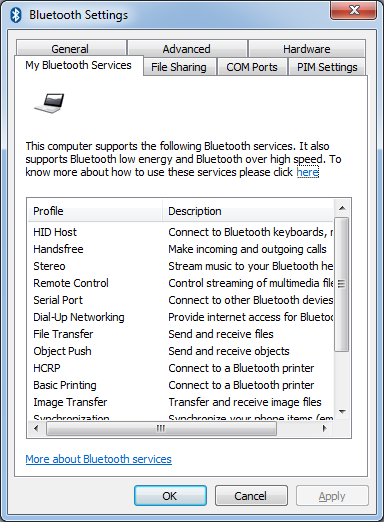 If you have Skype installed and running, it will also install a Skype plugin which allows the CSR Bluetooth software to integrate with Skype – just one of the “perks” of a proper Bluetooth stack, as compared to the Windows default stack. 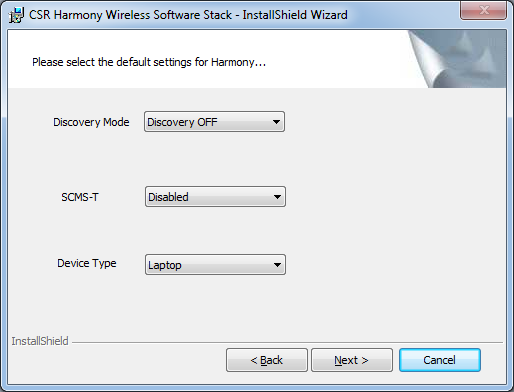 You can now explore the settings within the Harmony stack and commence adding devices to your system. 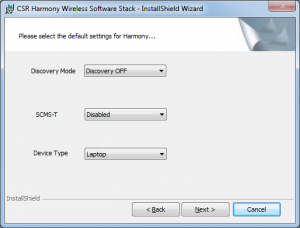 The settings within the Harmony stack allude to many more possibilities than offered by the default operating system Bluetooth stack, or indeed, some aftermarket ones as well including support for Bluetooth 4.0 low-energy security tokens. This may come in extremely useful in the future as low-energy devices become more popular. Unfortunately, there doesn’t seem to be any supported way to update the software, aside possibly by visiting the Vendors’ web site in the future. As a result, when devices using newer profiles not supported by the software need to be used, you may need to upgrade or purchase a new software stack (or dongle and software stack together). Pairing devices compared to using older Version 1.0/1.1 dongles is relatively simple thanks to the Secure Simple Pairing. Many newer devices display a code for you to check and accept the pairing, or pair without needing to enter any codes, making it much more painless. To initiate pairing, one must put their Bluetooth device into pairing mode before initiating a device scan (either by category or all). The time-out on the scan is relatively quick, so be sure to initiate pairing mode on your Bluetooth device before starting a scan. For example, to pair a headset, you would choose audio/video device, and your device should show up in the scan shortly. Select the device, and click next, and secure simple pairing takes care of the rest. Drivers for your specific device should install automatically without trouble. If not, please see the next section. Once that succeeds, you should see a bubble indicating the connection has been established. If you have paired a headset, the Skype integration will change the audio devices for you automatically. I’m glad to report no audio problems at all with this stack and the Native Union Pop Retro Bluetooth Handset. Great stuff! Integration with Skype also allowed for double-tapping the button to initiate a call, and single tap to hang up. I also had no trouble pairing my Jabra BT-135, Samsung Galaxy SIII and my Bluetooth Keyboard to it, although A2DP Media Audio streaming from the SGSIII to the computer curiously refused to function (even with SCMS-T turned on during installation). This may be a compatibility issue. 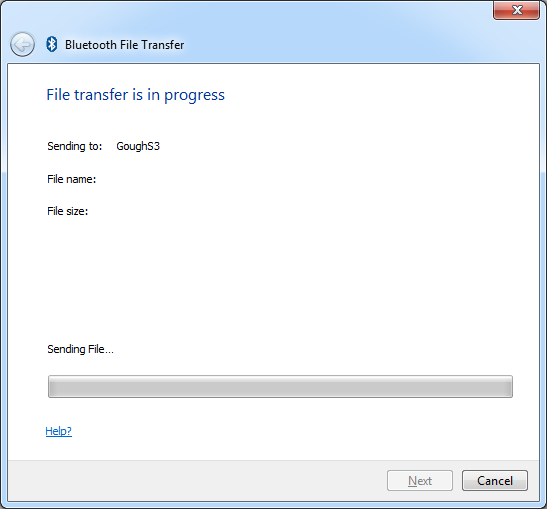 File transfers to the S3 are easily accomplished by right clicking on a file and navigating to Send To, followed by Bluetooth Device. Other than that, buttons are added into Microsoft Office as well so that you can send a file directly from the ribbons interface. Sending with the Bluetooth 4.0 dongle (at v2.1 EDR rates) is about three times faster than sending with my old Bluetooth v1.1 dongle. To test its Low-Energy radio abilities, I was able to scan for and pair with my Adonit Jot Touch and Jot Script, although as there is no profile support, the connections are not usable. I later tried a serial Bluetooth GPS unit with no dramas, however, unfortunately as I don’t have an A2DP Bluetooth Stereo set, I can’t comment on how that would perform. However, the manual states there is apt-X support, and I would hence expect the best Bluetooth Stereo quality you can expect. So you ran into trouble … try this! 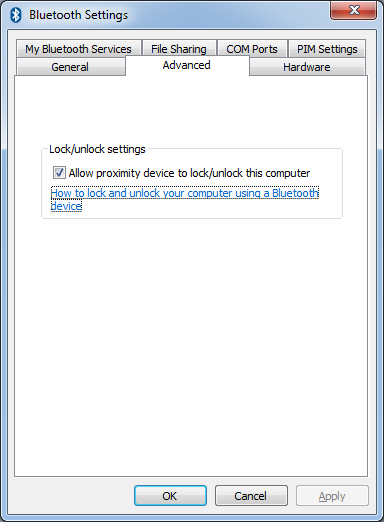 … and now any attempt to remove it, or uninstall the Bluetooth stack never finishes! The reason why this might occur is if you have used a CSR Bluetooth Dongle in the past with the Microsoft default Bluetooth Stack, and paired a device (e.g. Handset/Handsfree) which requires a driver and allowed the installation of drivers from Windows Update. 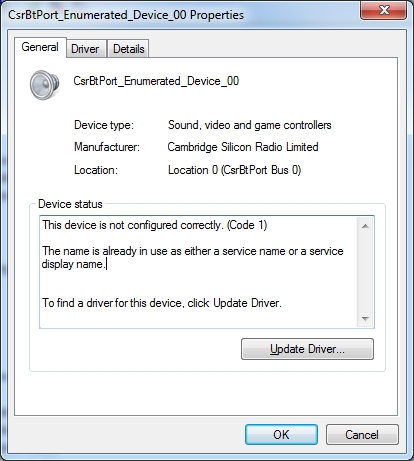 These drivers come from CSR as a courtesy to CSR dongle users so that they can have audio with older dongles, but these courtesy drivers conflict with the proper drivers provided in Harmony as they use the same service name. Unfortunately, “removing” and “uninstalling” the old dongle through Device Manager or Devices will not solve it. Quite a few people have this problem online, and there hasn’t been a clear way to solve it. However, by learning a little bit about the driver framework, I’ve managed to devise a method which seems to be able resolve this issue. Please note that working with the Registry can cause serious damage to your system if you make any unintended alterations. I take no responsibility for any damage you might cause to your system – but this did work for me. If your problem device is stuck with the “The name is already in use either as a service name or a service display name” error, please proceed directly to Step 3. If you have somehow forced the wrong driver to install anyway (e.g. 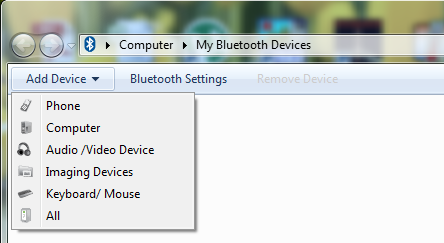 the Bluetooth Hands-Free Audio device), you will need to go to Device Manager and remove it first. The computer may seem to be removing the driver but will never finish. Remove power to the computer and restart it. Check that the Bluetooth Hands-Free Audio device doesn’t show under Sound, video and game controllers. It’s okay if it shows up with an exclamation mark somewhere else. If it still shows up, try rebooting into Safe Mode (press F8 on booting) and back to regular mode. Remove the CSR Harmony stack using the Add/Remove Programs in Control Panel. Be a little patient, it should take 5 minutes at most. 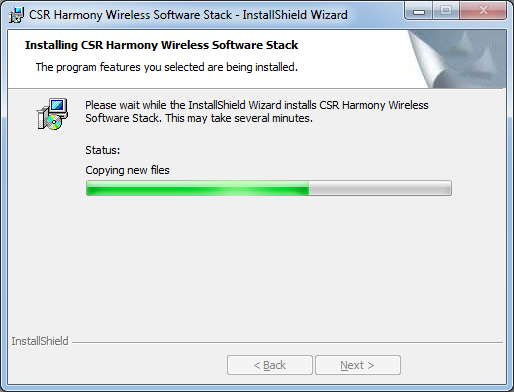 If you have the wrong driver installed (Step 2), but failed to remove it, CSR Harmony will not uninstall and will hang during uninstall. If the dongle has been removed, plug it back in and go to Devices and Printers. 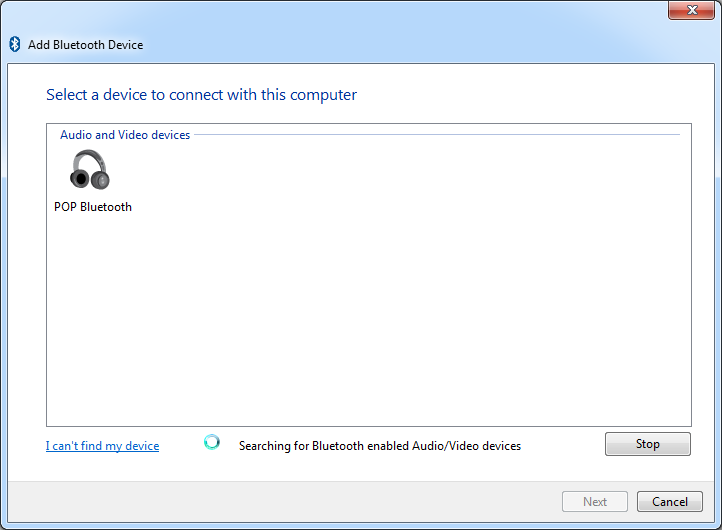 Find any Bluetooth devices except the dongle and right-click Uninstall and select to delete drivers. 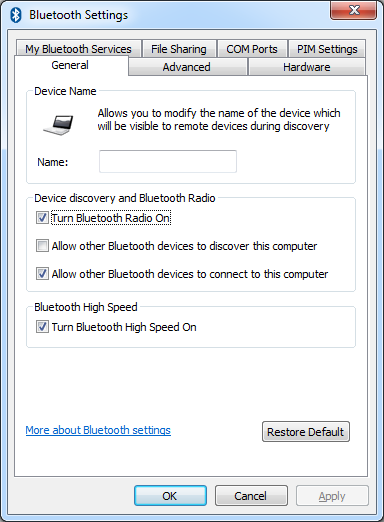 Go to Device Manager and delete the Generic Bluetooth Radio. Get out Registry Editor by pressing Win+R and typing regedit and clicking OK. You will need to grant administrative privileges for this to work. While you are there, also look for folders starting with bth that have sub-folders. In the case of Bluetooth Hands-Free Audio, this is the BthAudioHF entry – delete that too. Do not go deleting things randomly – you will mangle something serious. Delete Bth* entries which are named with the problematic device name or contain a driver file name which is used by the CSR provided drivers – in the case of BthAudioHF, it points to the driver with conflicts with HFGService. Reboot your computer and reinstall Harmony as before. Re-pair the device. You should find it functions correctly. While not officially supported by the manufacturer for use with Linux, I threw it in with my Linux machine running Lubuntu 13.10, and it detected the dongle immediately and blueman was able to help me run a few file transfers just fine. Unfortunately, audio stubbornly refused to work, but this is quite a common issue with blueman and bluez. Lets just say, while not as speedy as Wi-Fi, it’s a pretty decent speed increase. 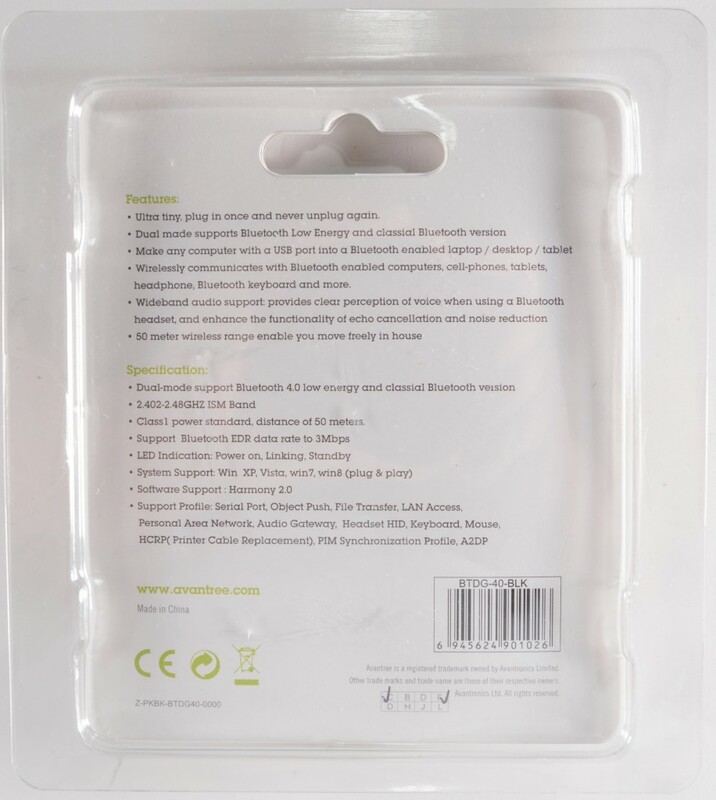 The Avantree Bluetooth 4.0 MicroUSB dongle is a solidly built Bluetooth dongle supporting the latest Bluetooth Smart/Low Energy modes. 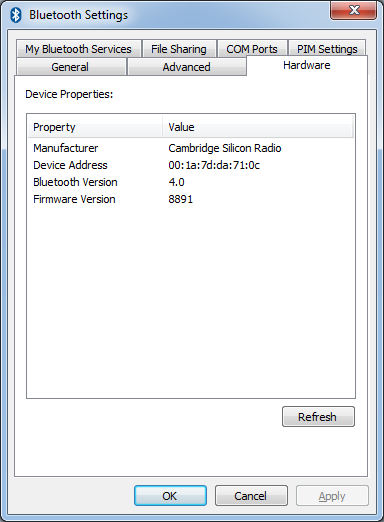 It is based around a quality Cambridge Silicon Radio CSR8510 A10 bundled with a fully licensed (some lower priced dongles have issues here) and fully featured CSR Harmony Bluetooth Stack offering full support for both 32-bit and 64-bit Windows XP through to 8 installations. The dongle also had no problems functioning under the bluez Bluetooth stack under Lubuntu 13.10 Linux, although support for profiles beyond just file transfer (OBEX) will depend on your distribution of Linux and troubleshooting skills (as there are many little compatibility issues between certain Bluetooth managers (e.g. blueman) which may cause problems). Additionally, the software supports the apt-X codec which allows for higher quality Bluetooth stereo audio (A2DP) with compatible CSR apt-X enabled speakers and headsets. This is a feature which you won’t find anywhere else, although I wasn’t able to test this given the peripherals I currently own. The software is quite easy to use and installs correctly first time on a “fresh” machine which has never seen Bluetooth devices before. It also installs correctly on machines which have previously used other Bluetooth chipsets, but have had their software removed cleanly (e.g. IVT Bluesoleil, Broadcom/Widcomm). Unfortunately, if upgrading from a prior CSR Bluetooth device using the operating system’s Bluetooth stack and also CSR drivers from Windows Update for Headsets/A2DP, you may encounter driver conflicts as I did. This seems to have affected a few others, and although I managed to work out a method to resolve this, it doesn’t make for a seamless user experience. This is seems to be a problem with CSR Harmony’s installer/uninstaller. Given its capabilities, I would recommend this product based on the strength of the Bluetooth stack software, its compact size and decent range. And as usual, Mobilezap was quick to deliver, flawlessly as always. Talk about exciting – only just a few more days until the Samsung Galaxy S5 is out. Need some accessories for your brand spankin’ new S5? Click here. This entry was posted in Computing, Tablet, Telecommunications and tagged bluetooth, computer hardware, mobile, mobilezap, wireless. Bookmark the permalink. Thank You very much for this very detailed explanation. Hi lui_gough thanks for your very detailed article very professional/knowledgeable. I have Inateck USB Bluetooth 4.0 Low Energy USB Adapter USB 2.0 Wireless Bluetooth Adapter with LED Indicator For PC Desktop Computer Laptop Notebook, Compatible with Windows XP/ Vista/ 7/ 8 & Bluetooth 3.0/ 2.0, Support Bluetooth Stereo this also supports AptX codec for what i purchased, my laptop is win7 32bit I want to stream music/audio highest quality to my AptX bluetooth 4 headphones/speaker. I did have installed various other bluetooth software which as far as i know i removed correctly but iam not 100% sure, I tried the trouble shooting to remove any trace of drivers using your guide RE: So you ran into trouble … try this! Please carefully follow these steps: I removed all these driver remnants below i did get my headphones to work but audio was terrible and crackling! But there where a few other remnants that started with csr… i did not remove as i did not want to possibly cause more problems, what do you think? 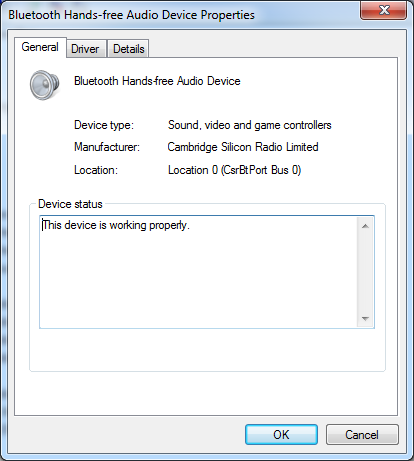 Are you having problems when you install your Bluetooth audio device and it fails to install correctly? Maybe the Connect button in the Bluetooth Places is greyed out after pairing? Or does it show the exclamation mark in Device Manager? Or does it not even install and complain of a lack of drivers for your particular device? Will need more detail on the specific error to provide better advice. BthAvrcp is responsible for the remote control button handling. Most Bluetooth Stereo headsets and speakers will need to use the hands-free profile, the A2DP profile, and also for media buttons, the AVRCP profile. If something goes wrong with any of the drivers for these profiles, you may experience problems installing and using your device. Remember, tinkering with your registry can be dangerous. If you have any doubts, I would recommend exporting the keys you are going to delete into a .reg file to back it up. Then, in case of trouble, you can re-import them. If you are having issues installing the driver for your Bluetooth speaker, I think you should also remove the current drivers through uninstall, and remove the list of keys plus registry keys for csr_a2dp, CSRBC, CsrBthAudioHF and BthAvrcp (to make sure all the other older drivers are cleaned out). 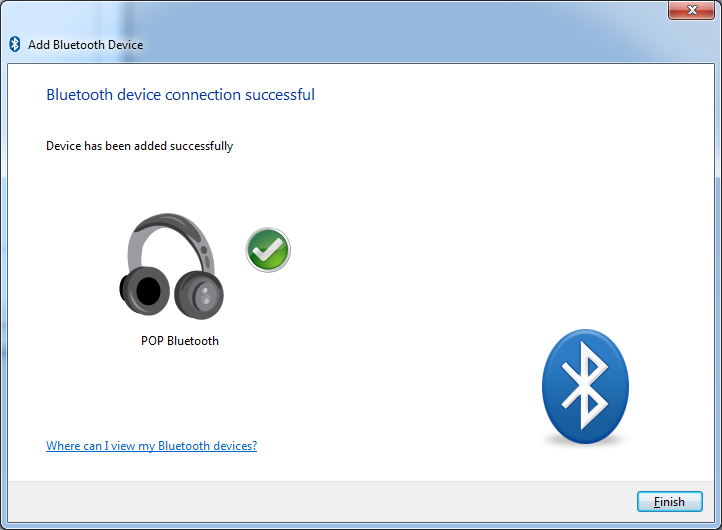 Then, reinstall the driver, and re-pair your Bluetooth audio device. 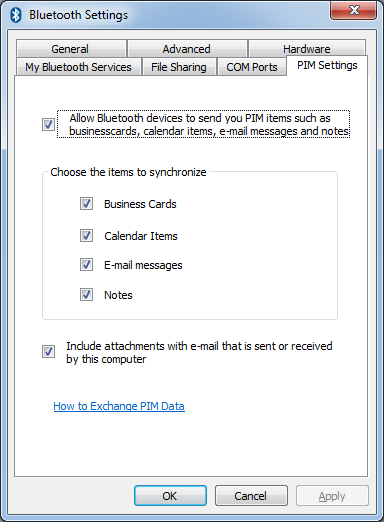 It would help to know exactly what error you are getting in Device Manager, or what issues you are experiencing, however, depending on what your previous Bluetooth stacks were, their registry settings may be under different names which I won’t know about. It’s good that you didn’t go deleting keys without some level of care, because you can really mess things up by “randomly” deleting things. How can I manage to use the harmony stack? If the Harmony stack is not taking control, it is likely because the USB PID and VID of your dongle is not supported by the .inf file in the Harmony package and therefore the driver is not installing. 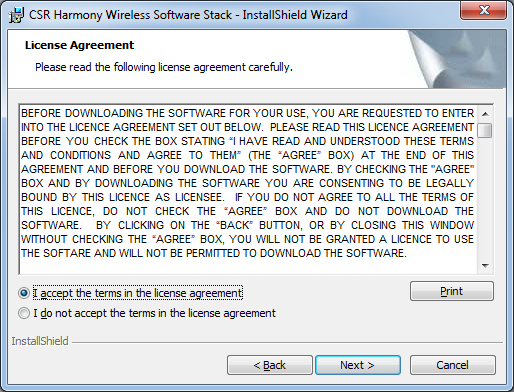 You will need to have an adapter with the right credentials and properly licensed for the Harmony stack to use it. 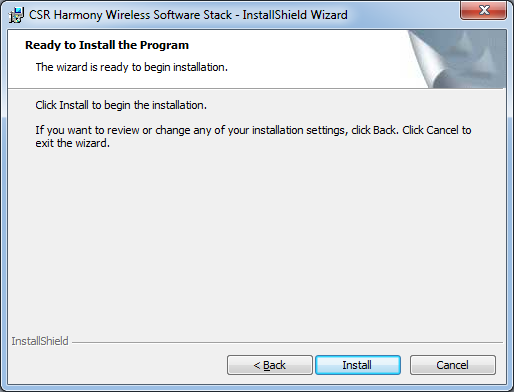 Check in Device Manager whether you can Update Driver, and choose the driver manually from within your Harmony installation. If not, then I’m afraid the only way is to try it on another computer, or to buy another dongle. The very adventurous may force installing the driver anyway, but this may cause even bigger issues, like blue screens of death or license error messages from Harmony. You try these options at your own risk. After going through the process to get rid of prior CSR registry entries, I still got the same failed error, even after restart. I don’t really mind though because I’m still able to pair with my phone and make use of AD2P. I followed your steps in “So you ran into trouble … try this!” and it worked. Thank you very much! I can’t thank you enough for fixing my bluetooth issues – I don’t even have the same dongle but came across this and it solved my issue. I love you. Thank you very much for your review especially how to solve the driver conflict problem. Unfortunately, I can’t help you with that. It seems to be an issue with the pairing. Does your USB BT dongle work with other devices? It may have to do with a pairing incompatibility in pairing methods, but it’s nothing I can help you with unfortunately. From the information you’ve given me, you’ve gone about troubleshooting it the same way that I would have, so I don’t really have anything to add to it. Thanks Dude I Love you……! Is this an isolated incident or is this also present on your setup after installing the CSR Harmony v2.1.63.0 software? I haven’t noticed the issue in part because I don’t have any aptX compatible peer devices to connect to. Without them, I don’t use the dongle on a regular basis either (I don’t leave it plugged in unless I actually need it). I suppose it could be possible that there is a memory leak issue, but I cannot confirm nor deny it at this stage. That being said, aptX Bluetooth technology is a CSR specialty, so there’s not really anyone else you can go to. As far as I know, all apt-X compatible dongles use CSR chips and CSR Bluetooth stacks. thanks man, had to try different times but finally I got it working! You are a hero, thank you 🙂 I followed your “So you ran into trouble” steps & it has fixed the issue on 2 computers. Saved me a Windows reinstall so I really can’t thank you enough. Keep up the good work & god bless you. 1) ALL of the keys which are specifically listed in the provided steps, above. 3) Also ALL keys which started “BTH”, too. One of these refused to fully delete with an “access denied” error, so I left it partially deleted and carried on with the rest of the steps. I too had to remove all keys as above and now my BT headset is working fine now. Including aptX. Additionally to get Remote Desktop Connection working I had to rename file “C:\Program Files\CSR\CSR Harmony Wireless Software Stack\BLEtokenCredentialProvider.dll”. After hours and hours of figuring out what was the problem, I was able to fix the problem. This walkthrough solved majority of the issue, plus, I’ve found out after the process that one of my laptop’s USB port is damaged (I only have two; the damaged one was the one I’ve been using the entire time). Might’ve been the main issue all along (shame that I didn’t thought of it early on). Thanks Mr. Gough for posting this. I’m sure it’ll help more people (especially tech noobs like me) later on. 😀 !! Thanks so much for your troubleshooting guide! Worked like a dream! I just wanted to add a little something to your guide that you and others may find useful. I was able to find a way to get my bluetooth dongle and headset working on linux before I found this guide to help me to set it up on windows. I am using Zorin, which is based on Ubuntu. I went to the software center and installed the Blueman Blutooth Manager. 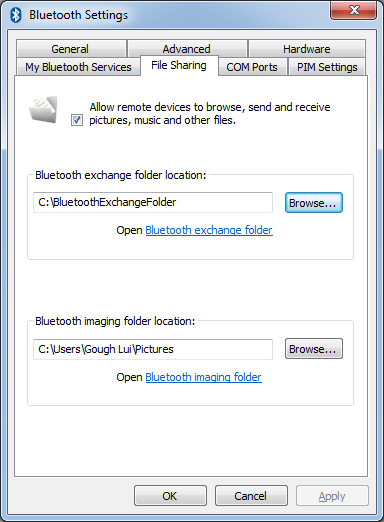 After opening the manager, I was able to pair the headset easily by setting it on discovery mode, then right-clicking the icon which appeared for the device in the bluetooth manager and selecting ‘pair’. In order to get it to play audio, I had to jump through hoops. Thanks Arren! I’m sure readers will appreciate this :). Wow this helped me! this was the issue, what a great article!! Thanks so Much! Wow, thanks! I did delete the suggested folders and the csr_a2dp folder out of curiosity. When I completed the next steps it failed to load the A2DP driver, but everything else worked. I rolled my registry back, followed the same instructions and this time left csr_a2dp folder in the registry and all drivers loaded the next time around. Thanks again! Thank You so much!! I’ve been scouring the internet for hours trying to deal with this Enumerated Device problem!! You are so awesome! Ton aide m’a été d’un grand secours. Sans celui-ci, j’aurais mis ma clé Bluetooth à la poubelle. J’ai suivi tes instructions à la lettre à deux reprises sans résultat. Etant très têtu, je me suis obstiné une fois de plus, cette fois-ci j’ai éliminé tous les dossiers qui commençaient par CSR malgré ta mise en garde, qui pour les novices comme moi sont indispensables. Eureka ça MARCHE. Un gros Merci Lui. Excuse-moi Gough en te relisant je me suis mépris sur ton prénom.. Ciao ! I bought a dongle with the older driver 2.1.61.0. When connecting it to bluetooth printer it doesn’t ask for pairing code and even though it appears as paired it is not connected, and the software leaves no option to correct this problem. Do you have an idea why it behaves like this? And do you think updating to the newer driver 2.1.63.0 might help? Where can I download driver 2.1.63.0 ? Brief answer: Bluetooth 2.0 and above devices has secure simple pairing functionality that eliminates the need for passcodes to establish a secure link. For supporting devices at both ends, a passcode will not be required during pairing. In some cases, some companies have deviated slightly from standards and can cause pairing issues. Otherwise, your devices may have paired, but the driver may not have the right profile support to enable printing, and the device may ship with a driver to install but this expects to use the default Microsoft Bluetooth stack instead. So sadly, there isn’t a surefire way to get one thing working without potentially breaking another. 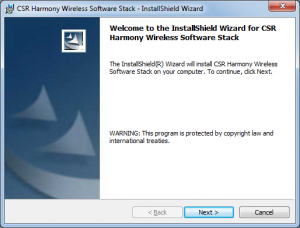 You could try the newer drivers at your own risk, and you’ll have to go searching for them yourself, although, to be honest, the Harmony stack is “ageing out” and it doesn’t seem CSR support it anymore. Or you can revert to the Microsoft default Bluetooth stack by uninstalling the dongle, but that will break proper audio support even if you reinstall the stack (unless you clean certain Bluetooth related keys from your registry). Or you can use another non-CSR supported dongle in parallel with your CSR dongle, and have the printer connected with the non-CSR dongle using the Microsoft stack, which may work. I’ve run multiple BT radios from the same machine for this reason in the past. I just followed your guidelines the silly thing finally works !!!!! WOOOOOOOWWWW !!!! You should be awarded with the Bluetooth Dongle Nobel Price !!!! Just wanted to say thank you. I had been dealing with pairing an audio device using my CSR dongle for 2 days and I was able to achieve this by following your regedit instructions (the device, at first, was paired while the default Microsoft supplied driver was active) – thank you! Thx for your help, finally I make it work will my Window 10. Thank you so much for making this guide!! I’d spent the previous few hours messing about installing and reinstalling various drivers until I came across your registry guide and it worked first time!. Thanks for taking the time to write this article. It worked perfect. Real thanks! I had the problem and resolved it thanks to your “procedure”. I can’t thank you enough for posting this. I’ve been looking for a solution forever and your suggestions got it working for me. Thank you! Please add me to your list of grateful readers. I followed most of your instructions; some of the registry keys were not present in the registry. 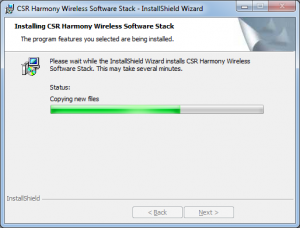 After uninstalling CSR Harmony software, performing the registry modifications and using CC cleaner to clean up the computer and the registry, which was a real Muther, (Half a word), I was able to reinstall the CSR Harmony software after rebooting. It is a shame that CSR made such crappy software, but thank goodness for smart people like you. merci (thanks from a french user !!!). You solved my problem perfectly ! 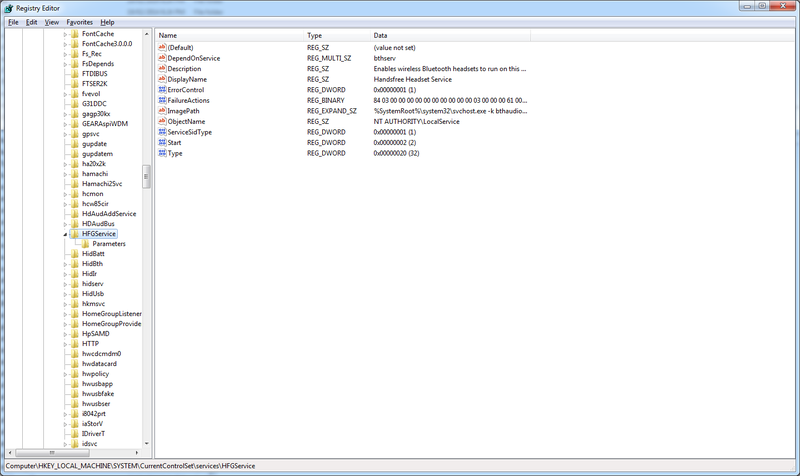 – Following this troobleshot guide but deleting every bth keys related to bluetooth and each csr* keys in the registry. During reinstallation, I chose Laptop instead of computer, even if it wasn’t the correct choice. After that, pairing was good, missing driver installed themselves and I was able to enjoy music with my QC35. Thanks for your reply to this thread. I failed when trying the excellent troubleshooting guide by Mr. Gough. I redid all steps exactly the same way as the first time and chose Laptop (default) instead of desktop. That did the trick !! I wish device suppliers did their jobs half as well as you! This problem may have never occurred if 1) the device uninstalled all entries into the registry such that a fresh uninstall-install process would fix driver assignment issues. 2) The supplier made certain that their driver names did not conflict with other drivers. The PC world is antique.. this sort of thing need not happen and only occurs because of industry laziness IMO. Holy moly! I got it working after many days as well. Indeed the problem was the conflict with the remnant BT registry entries but in order to get it working I learnt this: you CAN NOT rename the registry entries like csrusb -> csrusb_BACKUP or so. Windows will still find the entries and you get NOWHERE! You do have to delete them! For me the entries to delete weren’t the same, but I deleted csr* (one was not possible to delete, didn’t matter) and I deleted bth*. Then, after a reboots, the CSR Harmony 64-bit setup.exe (224 032 KB) worked perfectly and normally with Sennheiser Momentum 2.0! Thanks man for this great review! Thought of returning back the device to Amazon. Your post really helped me.